CARFAX 1-Owner. Nav System, Moonroof, Heated Leather Seats, 4x4, Panoramic Roof, Heated Rear Seat, Power Liftgate, Aluminum Wheels SEE MORE! Leather Seats, Navigation, Sunroof, Panoramic Roof, 4x4, Power Liftgate, Heated Driver Seat, Heated Rear Seat, Cooled Driver Seat, Back-Up Camera, Satellite Radio, iPod/MP3 Input, Onboard Communications System, Trailer Hitch, Aluminum Wheels. Rear Spoiler, MP3 Player, Remote Trunk Release, Privacy Glass, Keyless Entry. ENGINE: 5.7L V8 MDS VVT GVWR: 6,800 lbs, 230MM Rear Axle, 3.09 Rear Axle Ratio, Anti-Lock 4-Wheel Disc HD Brakes, BLIND SPOT & CROSS PATH DETECTION, TRANSMISSION: 8-SPEED AUTOMATIC (8HP70) (DFK). 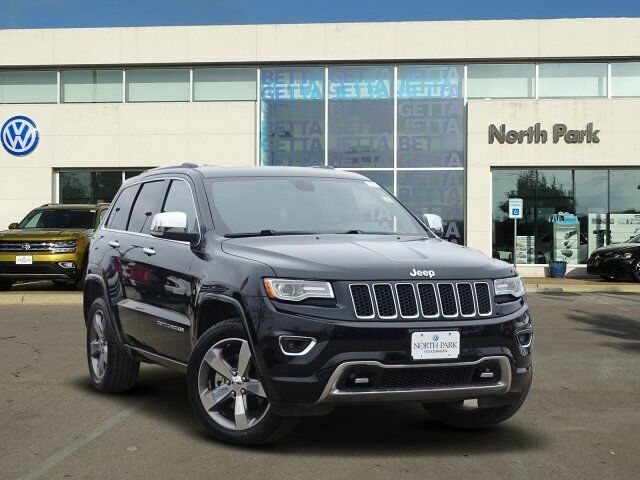 "If you want a midsize SUV that does a little of everything, the 2015 Jeep Grand Cherokee is the way to go. Its well-trimmed cabin is comfy for five, and it's one of the few remaining utility vehicles that can handle both off-road trails and daily commutes." -Edmunds.com.